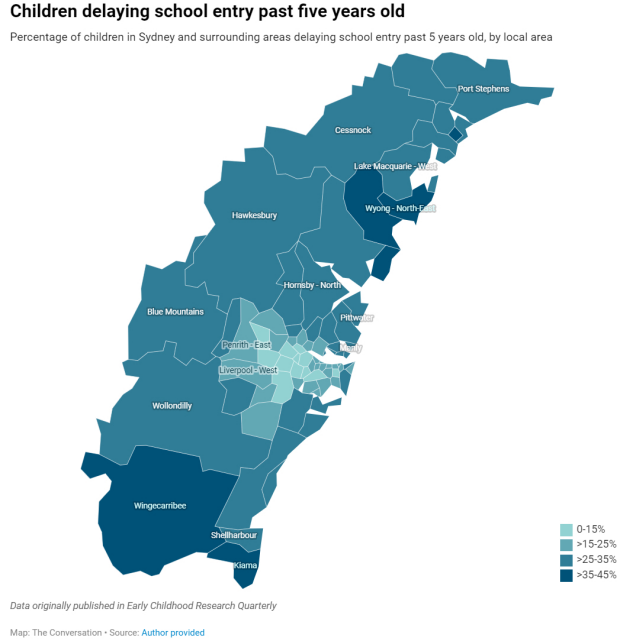 Boys, younger children and children from relatively advantaged families and neighbourhoods – particularly in Sydney – are more likely to delay starting school. These are some of the findings of our study on who chooses to delay sending their children to school and how a child's age when they start school is related to their "school readiness". Our study used data on more than 100,000 NSW public school children in their first year of school. The data sets were collected as part of the Australian Early Development Census in 2009 and 2012. The census takes place every three years and is based on teachers' knowledge and observations of the children in their class. Children's development is scored between 0 and 10 on each domain. Children with scores in the bottom 25% are considered developmentally vulnerable or at risk. In this study, we considered children with scores above 25% in all five domains to be developing as expected. We combined the developmental data with information from other routinely collected population data sets, such as birth registrations, midwives and hospital data, to better understand children's health and family circumstances. We found children were more likely to be ready for school with each additional month of age at the start of the school year. The differences in children's development were quite small month to month – there wasn't a big gap between August-born and September-born children, for example. Our findings are also relevant to the ongoing debate about school enrolment policies in Australia and the potential impact of these on the make-up of classrooms and children's school readiness. Kathleen Falster is a Senior Research Fellow at UNSW. Mark Hanly is a Research Fellow at UNSW. Ben Edwards is an Associate Professor, Child and Youth Development and Longitudinal Studies at Australian National University.